The Solomon Islands special envoy on West Papua, Mr Rex Horoi, has reiterated the right of his country - together with Marshall Islands, Nauru, Palau, Tonga and Tuvalu – to bring claims of Human Rights abuses to the United Nations. His statement comes as a response to Indonesian allegations that the five countries have used false and fabricated information in their accusations. Mr Horoi assures their commitments will not be dampened by Indonesia’s response, as he refuses to “turn a blind eye to the deaths of 500.000 West Papuans over the course of the last fifty years. Human Rights violations towards West Papuans are a central issue in the report UNPO submitted on 22 September 2016 for the Universal Periodic Review of Indonesia. 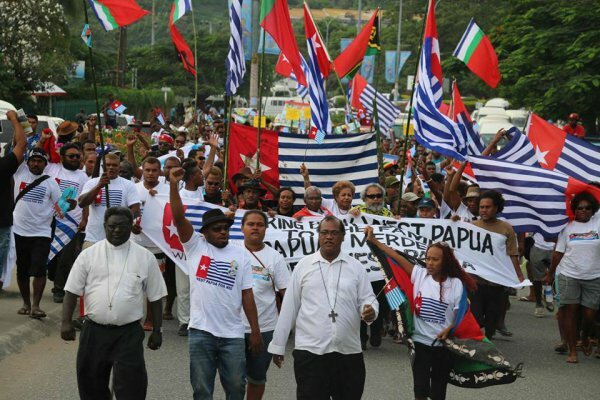 In response to Indonesia, Solomon Islands insisted its right and that of six other Pacific Island countries to bring claims of human rights abuses in West Papua to the United Nations, in an attempt to find a solution to the 50 year old problem. Rex Horoi, Solomon Islands special envoy on West Papua in his reply told the UN General Assembly that more than 500,000 Melanesians in West Papua have been killed in the last 50 years. “Solomon Islands has received reports from respectable sources including fellow UN member states and moral leaders from civil societies illustrating a lack of protection of human rights of Melanesian people of West Papua. “Our concern has to do with the increasing loss of lives at the hand of Indonesian authorities. We may argue that mistakes are made and that lives are lost as a consequence, but how can we as members of this august body, defender of human rights and the body of reference in ethical and moral values turn a blind eye to the deaths of more than 500,000 West Papuans over the course of the last 50 years?”, said Horoi. Horoi emphasised the commitments of Solomon Islands and the five Pacific states – Marshall Islands, Nauru, Palau, Tonga and Tuvalu – will not be dampened by Indonesia’s non-committal response. “The lack of will from Indonesia will not dampen the commitment of Solomon Islands together with six other Pacific Island Countries to pursue dialogue and constructive engagement as the only means to resolving this matter. We understand that through constructive engagement and dialogue we can realise the Articles of the UN Charter and the subsequent international human rights conventions that Indonesia has ratified, said the Solomon Islands special envoy on West Papua. Replying to Indonesia’s call for Pacific states to stick to their concerns of the impacts of climate change, Horoi admitted while those development challenges were real for Pacific countries – the human rights abuses in West Papua required an equal and urgent attention of the United Nations family of nations to resolve. Solomon Islands, Horoi said is willing to engage with Indonesia on the matter of West Papua. “In fact our Pacific regional and sub-regional bodies have indicated their willingness to discuss this matter with Indonesia as we are all concerned with the increasing loss of lives in West Papua. We can together as a family of national must address the human rights violations and the loss of lives in West Papua. Horoi said his country cannot accept the argument of sovereignty and integrity of any country and watch these atrocities take place. “It is our moral and ethical duty as member states to bring this unfortunate reality so that we together can find a way to stop the loss of lives and protect the rights of all human beings, be it in West Papua or any other country in the world”, said Horoi.